Set in a stunning landscape, an unmarked trailhead keeps this gem of a lake fairly quiet. The trail follows up a small stream to the lake. The walk through the pleasant forest isn’t alway alongside the creek, but when it is, it’s often a lovely cascade. After you climb about 700ft/210m the trail levels out as it enters the grassy, alpine meadows. This other-worldly landscape of low-growing green vegetation is dotted with large, gray boulders and pocket ponds. Crumbling gray ridges and the red ridge of Gaylor Peak are to the north, while mammoth summits such as Lyell Peak dominate the view to the south. 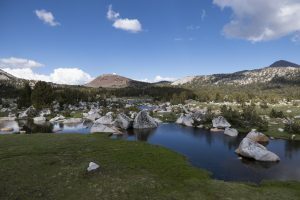 The trail traverses through the boulders and ponds to the edge of the lake tucked below a treed ridge and crumbling rock. 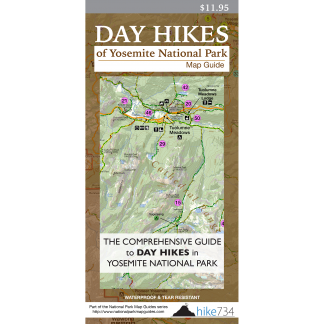 Trailhead: Look for a small, unsigned, gravel pullout approximately 4mi/6.5km west of Tioga Pass on the Tioga Road. Look for the trail sign just up from the pullout.